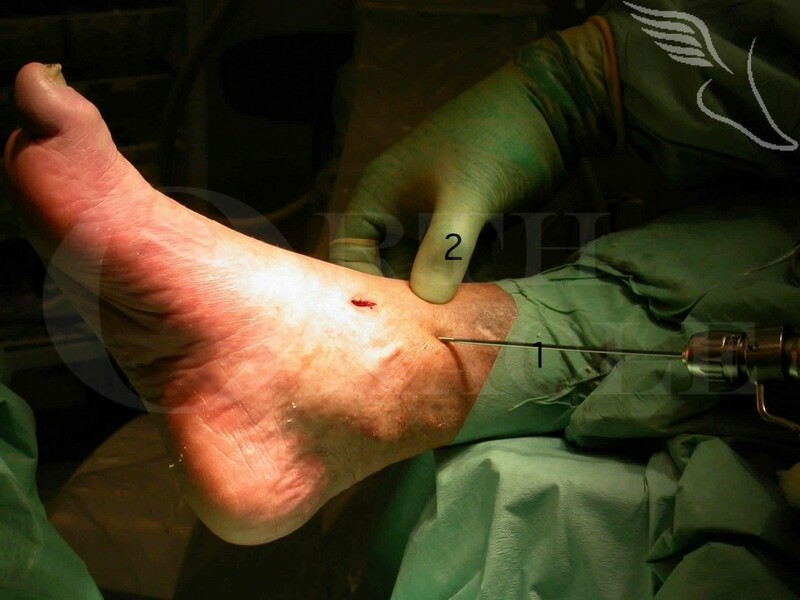 Learn the Arthroscopic Ankle Fusion using OrthoSolutions CSS screws surgical technique with step by step instructions on OrthOracle. Our e-learning platform contains high resolution images and a certified CME of the Arthroscopic Ankle Fusion using OrthoSolutions CSS screws surgical procedure. An arthroscopic ankle fusion probably has consistently the highest union rate of any ankle fusion technique. Often associated with low levels of short-lived post-operative pain if bone quality is good there is the possibility of early limited weight-bearing in compliant patients. Union rates in excess of 90% are normal and much of the post operative period can be spent in a post-operative boot rather than cast given the inherent stability of the maintained (as opposed to flat cut) articular surfaces. The technique is particularly useful for cases with poor soft tissue quality such as areas covered with skin graft or various plastic surgical flaps or compromised wound healing capacity such as diabetics. There is disagreement about its use in the presence of significant deformity though as long as passively correctible there is no issue. Even fixed deformity of the arthritic ankle can be corrected by differential intra-articular resection/preparation of the joint surfaces. In the presence of a mobile compensatory mid-foot and hind-foot a normal or largely normal gait pattern can be expected following arthroscopic ankle fusion. Appropriate patient selection is important and in-particular considering fusion carefully in those with pre-exisiting sub-talar or midfoot arthrosis which will deteriorate in many cases. These are the same considerations though for any ankle fusion irrespective of technique. Institution: The Wellington Hospital, London, UK.